The Black Glass Germanium Hybrid Overdrive uses a NOS black glass package Germanium transistor to drive multiple clipping stages. Its highly usable controls craft sounds ranging from a warm, creamy boost all the way to raucous, almost fuzzlike tones. In between, you’ll find dynamic overdrive tones perfect for pushing lead lines up out of a mix and adding color and interest to your sound. This circuit lived on the Masonorous pedalboard for months being tweaked and tested. It’s way more versatile than a normal germanium boost or treble booster and way more interesting than most transparent overdrives. It also consistently plays nice with other pedals, whether it’s being driven hard into fuzz territory by a preceding boost/overdrive or adding color and sustain to a following pedal. 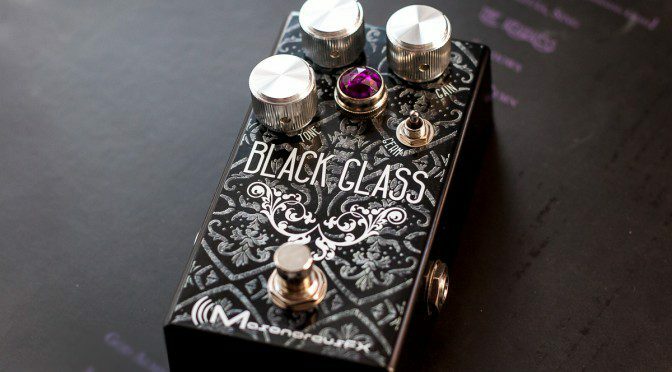 This video demonstrates the huge variety of tones available from the Black Glass and shows which settings will let you get dirty boost, bright boost, light to heavy overdrive, and even fuzzy tones, all from one pedal. Center = low gain, rounded sound, more diode clipping character, good for overdriven chords (0:55) when Gain knob is around noon, or a slightly dirty, warm boost (0:25) when Gain knob is low. Up = high gain, bright boost, Germanium transistor clipping, good for fuzzy leads or awesomely blatty chords. When the gain knob is low, this setting sounds really glassy and fuzzy, letting the transistor clipping shine through (3:42). When the gain knob is high, that fuzziness gets rounded off by later clipping into a great heavy overdrive sound for more compressed leads or thick chords (2:54). Also check out the Tone control settings shown in 2:00-2:40. It has a wide range, but it’s usable across that entire range instead of getting muddy or harsh at its extremes. $189 with free expedited shipping. (To purchase, visit the Black Glass product page). The online shop is brand new, so please contact us if you experience any issues using it. Every MasonorousFX pedal is hand-built with excellent components & close attention to detail and tested thoroughly to ensure that it’s ready for you.